Today, even under the threat of gales associated with Atlantic Storm Barney, we managed a crew of seven to tackle the day’s operations. Chalky and Geoff set about excavating the ballast to let in the new troughing run under both sets of rails. The remainder of the crew set about some serious block and bricklaying. In places from the position where the new ramp will start, we have now got seven courses of brickwork in place towards the south. This section is backed up with blocks to the same height. To give Colin a little break, other crew members have been involved with both brick and block laying. The next stage is to start the corbelling over the next four courses to the level where the platform edging slabs are ready to be installed. Despite dire weather forecasts, the team arrived ready for another stint of brick and block laying. 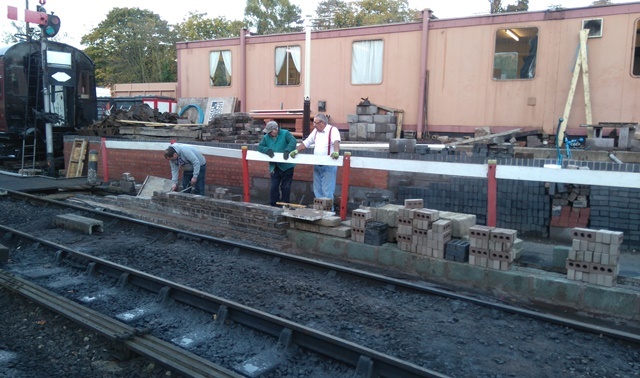 We managed to get three barrow loads of mortar mixed and used both on the platform 1 extension, and also the finishing touches to the base of the Platform 2 side of the barrow crossing. By about 12 noon the weather made its intentions very clear, with by now a constant annoying fine drizzle soaking everybody involved. 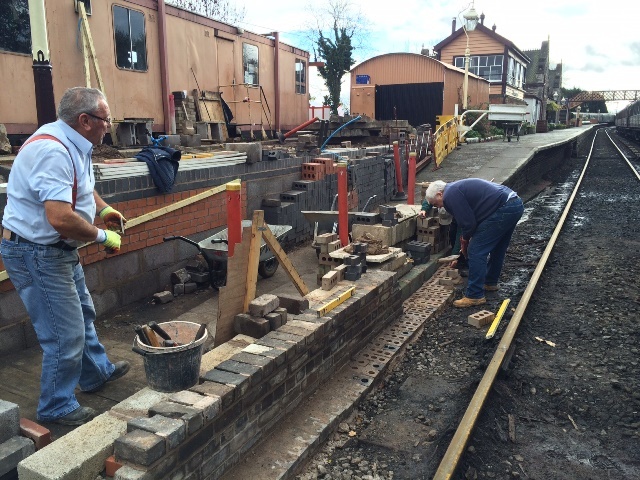 Still, with the time we had we have managed to advance south…wards with the platform extension brickwork,. This has been backed up with a good number of blocks. 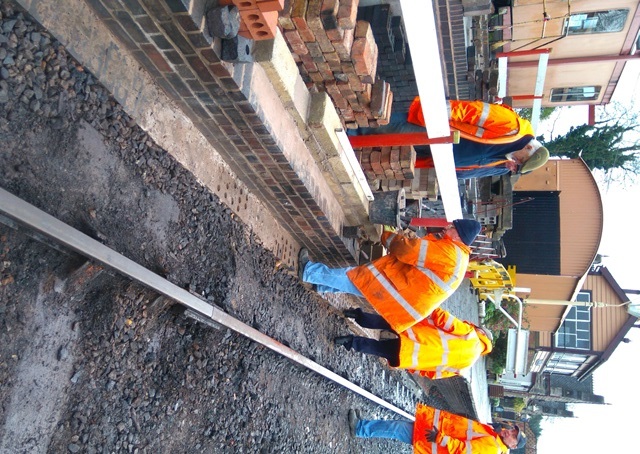 Andy has cut and laid the bullnose edging at the north end of Platform 2. As the saying goes, ‘Discretion being the better part of valour’, it was decided to give it best and take lunch at around 13 00hrs. Bearing in mind the complete absence of any change in the weather, the decision was made to clean the tools and get off home and hope for an improvement in the weather for Tuesday. 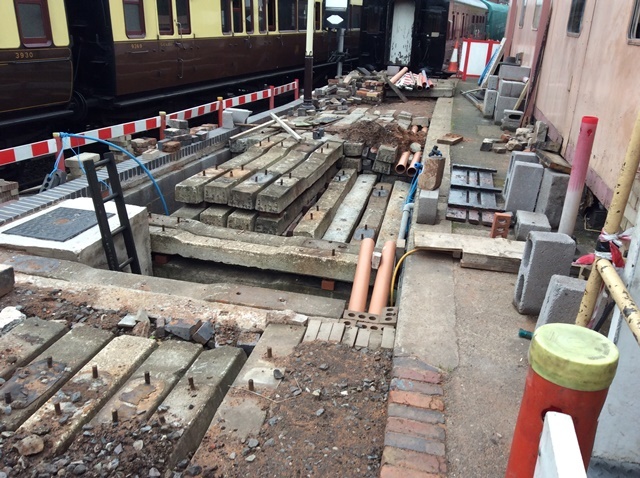 Look at our Bridgnorth Station facebook page for all the pics and info about how this station redevelopment big ‘pre-plan A’ project has gone to this stage.